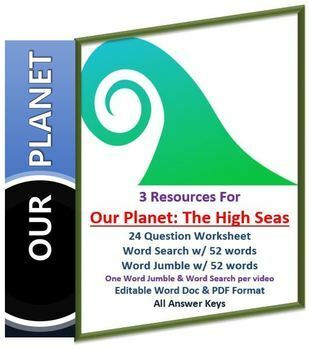 This video guide includes 5 instructional resources for use with the Netflix video "Our Planet: The High Seas". Check out my "Our Planet: One Earth" set of resources for free. The questions are answered about every 2-3 minutes. Have students answer them all, or just the odds/evens to prevent answer sharing or to spread out the amount of time between questions. The video questions are often word-for-word from the video. I made the questions so students focus on the video and the narration. Students can quickly answer these questions without being too distracted from the video. I guarantee students will hang off every word looking for the next answer! This has been true for both my 7th grade middle school students and my high school students. Great lesson for you or a substitute. Print a double-sided page with the word search on the front and the word jumble on the back. 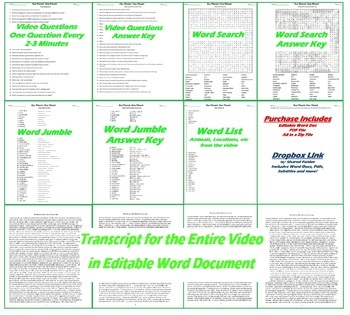 You can give students the option of completing the Video Questions or the Word Search/Jumble. Or just use the Word Search/Jumble as a filler activity for a sub. 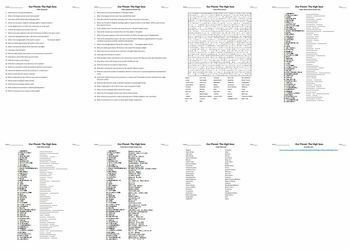 The included Word List and Word-for-Word Transcript can be use in variety ways in the classroom. Arguably the materials are appropriate for grade 5,6,7,8,9,10,11,12. 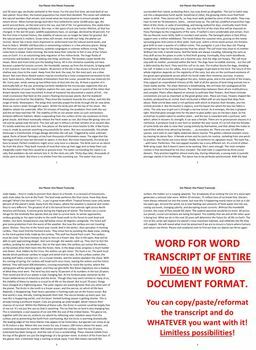 The file you are buying is a "zip" file with an editable "word doc" file an a "pdf", each document is 8 pages long. There is also Dropbox Link included on page 8 of the word document that includes a Dropbox folder for the video in "mkv" format and the resources in both word doc/pdf format.